The Osprey Ultralight Stuff pack is an incredibly lightweight and compact day pack. But it's not only great for day hikers, it's also useful if you're a backpacker that wants to set up a base camp and take day hikes out to explore the wilderness. In this review we'll take a deep dive into the pros, cons and alternatives to the Osprey Ultralight Stuff Pack and help you decide if it's the right choice for you. The Osprey Ultralight Stuff Pack lives up to it's name. Weighing in at 3.2 ounces and packing down to the size of your first, this day pack is amazingly lightweight and compact. It's super comfortable and easy to adjust and load up with gear. The only downsides are it can be tricky for people over 6' 2" to put on and water bottles easily slip out of the side pouches if you bend over. Here's a quick run down of the specs on the Stuff Pack. After that we'll dive into the pros and cons and some alternative options. The Osprey Ultralight Stuff Pack weighs 3.2 ounces. This makes it one of the lightest day packs available on the market. 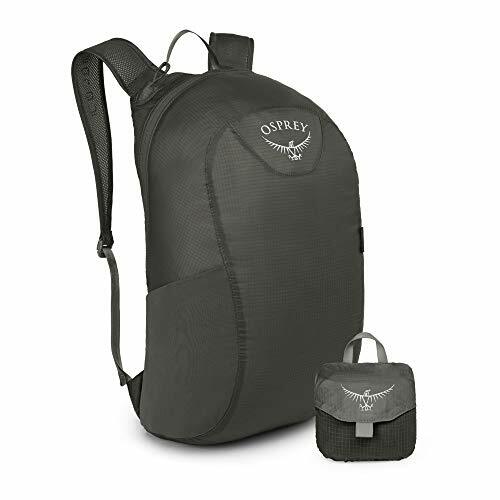 Osprey managed to pull this off by eliminating extra straps, pouches and zippers. This day pack just has one main compartment, a water bottle pouch on the side, and 2 shoulder straps. The Stuff Pack has an 18 liter capacity and measures 17" x 9" x 7" when it's filled up. It compacts down to the size of a closed fist which is about 4" x 4" x 2" . A day pack is just for day hikes. And that's mostly true. But these packs also make sense for backpacking. When I went to Colorado I got to camp in some awesome mountain ranges. But after hiking for a full day, I was exhausted and didn't have the energy to haul my heavy backpack up a mountain summit. If I had brought a day pack, I could have just brought some of my essential supplies and carried a fraction of the weight. A day pack can be useful if you're planning to set up camp and venture out to do some exploring around camp. Osprey did a great job with this pack and they nailed some of the most important features. Here's a run down of my favorite things about this day pack. Super comfortable - The Airmesh™ straps are super comfortable and feel great. You can wear this pack all day without feeling any soreness or pain in your muscles. Easy to load - Since it doesn't have a ton of compartments and zippers, this pack is easy to load up. Just jam everything in the main compartment and you're good to go. Lightweight - This thing only weighs 3.2 ounces. That's tough to beat for an entire backpack. Packs down really small - This pack compresses down to the size of your first which means it's easy to bring along with you on a backpacking trip. You can even store it in a coat pocket and have a full backpack ready to go when you need it. Good suspension - In addition to being comfortable, the straps on this pack do a good job of absorbing the impact of the load you're carrying and holding it steady on your back. Easy to adjust - This sounds like a minor thing but if you've ever had shoulder straps that are hard to adjust then you'll appreciate it. The straps on this pack are quick to adjust and stay in place really well. Osprey's attention to detail shines through and makes this pack stand out. Every little part of this pack is done extremely well and makes it a pleasure to use. This pack is amazing. There are a couple of things I'd change if I could, so let's take a look at the few drawbacks of this pack. There's just a few things I'd change on this day pack. None of them are deal breakers but they're worth talking about. Water bottle falls out of side pocket - The side pouch on this pack doesn't do a great job of holding water bottles in. During normal hiking this isn't an issue but if you stop and bend over to pick something up or tie your shoe, your water bottle will probably fall out. Zippers slide down - If you're wearing this pack for a long time and doing a lot of active hiking (like climbing up/down big hills, basically anything besides flat ground hiking), then the zippers have a tendency to slide down. The easy solution to this is to zip the pack shut and keep the zippers all the way to the sides instead of on top. Straps are close for tall people - If you're over 6' 2" or have a wide frame, the straps on this pack can be a little tricky to put on. This isn't a huge issue and won't be a problem for most people. This list is pretty short and the "issues" are pretty minor. It's hard to find the perfect piece of backpacking gear so it's pretty normal to have a couple of drawbacks. Personally I don't think any of these are dealbreakers and they're similar to what you'd find in other ultralight day packs. Normally I'd list 3-5 alternatives but the Osprey Stuff Pack is so good that there's really only 1 other option on the market. The Sea to Summit day pack only weighs 2.5 ounces making it lighter than the Osprey Stuff Pack. You probably won't notice the 0.7 ounce difference between the two packs but it's worth mentioning how crazy light this pack is. The main reason it weighs less is because there is no water bottle pouch. If you want a water bottle pouch, get the Osprey. If you're looking for an ultralight day pack, the Osprey Ultrailght Stuff Pack is a great choice. It's lightweight, small and comes with Osprey's awesome warranty. You'll be hardpressed to find a better day pack and it comes in at a great pricepoint as well. Osprey Daylite vs Daylite Plus – What’s The Difference?